This is one great healthcare company I hope I get a chance to buy in 2016. When I look for companies that I would be happy for my wife to own, I want to see diversification, a long and successful operating history, and a dedication to returning value to shareholders via dividends. And on that score, few match up to Johnson & Johnson (NYSE:JNJ). JNJ traces its history back to 1886. That means the healthcare giant has seen a few business cycles in its history and, more importantly, lived to tell about them. This isn't some start up that's only known good times. More than this, however, is how deeply engrained JNJ has become in our day-to-day lives. For example, the brand Band-Aids is synonymous with adhesive bandages, partially because Johnson & Johnson created them. And who doesn't know the company's baby shampoo? Although the consumer facing business is only about 20% of the company, it's still the public face of the Johnson & Johnson. So I like that Johnson & Johnson has managed to survive for more than 100 years. But I also like the diversification it offers. It operates in the consumer products space noted above, but also in the pharmaceuticals (about 45% of sales, rounding up) and medical device (35%, rounding down) markets. So in one investment you get exposure to a broad swath of the healthcare market, an industry that's set to benefit from a graying society as the baby boomers shift, in huge numbers, into their retirement years. A trend that's happening the world over in developed nations. JNJ largest business in the drug space is immunology, accounting for about a third of the company's fourth quarter drug sales. Neuroscience accounts for around 20%, with the somewhat catch-all Cardiovascular/Metabolism/Other accounting for another 20%. All three of these groups posted fourth quarter revenue gains when you strip out currency changes, with the immunology and "other" segments in the double digits. Oncology at about 15% of revenues, also posted double digit growth. Relatively new drugs treating type 2 diabetes, blood cancer, and prostate cancer were positives in the quarter and are likely to continue to help results in the near term. The lone standout in the drug business was infectious diseases, 10% of revenues. Sales in this segment fell roughly 20%. The main driver of the decline was OLYSIO/SOVRIAD, which faced competition from new products released by Gilead Sciences and AbbVie. While Johnson & Johnson's hepatitis C treatment was a notable disappointment, which will continue to weight on results in the near term, the truth is the company faces stiff competition in each area in which it operates. Moreover, it's varied portfolio of drugs stretched across the various stages of the profit life cycle. So at any given time there will be drugs on the upswing and drugs that are faltering. It has the size, scale, financial strength, and diversity to handle such swings over the long-term. One notable issue to watch in the near-term on the drug side of the business is acquisitions. Last year Johnson & Johnson was hesitant to step into what it viewed as an expensive market, according to CEO Alex Gorsky. With iShares NASDAQ Biotechnology Index ETF (NASDAQ:IBB) down by roughly a third since the middle of 2015, that could soon change. In fact Gorsky hinted strongly during the fourth quarter conference call that acquisitions would continue to be a big part of the company's future, in drugs and beyond. Which brings us to the company's last major business, medical devices. The two big business here are Orthopaedics (think knees and hips) and Surgery, which each accounted for around 38% of sales in the fourth quarter. The overall medical devices division saw revenue growth, taking out currency impacts, of 3.4% in the fourth quarter. But JNJ isn't pleased with that and is restructuring the unit to better support key growth areas like trauma care and knees. In this instance, the company is hoping to save up to a billion dollars a year on the cost side by 2018 which can be pushed back into the business on the research and development side to spur growth. But in many ways this is really par for the course at Johnson & Johnson. Indeed, the take away from all of this really highlights the fact that Johnson & Johnson is probably best viewed as a portfolio of medical companies, a medical conglomerate if you will. In total, JNJ operates a collection of over 250 companies spanning some 60 countries. This provides diversification, but it also allows JNJ to change the roster as time progresses, putting money to work where it believes the best opportunities exist and exiting areas that are less desirable. And sometimes it can take fairly drastic actions. For example, in mid 2014 the company sold the Ortho-Clinical Diagnostics business to The Carlyle Group for approximately $4 billion. This was a division that was lagging industry peers and offering growth prospects that were below JNJ's long-term goals. By selling it the company raised capital it could deploy elsewhere. Basically, I expect Johnson & Johnson's constantly shifting portfolio to keep up with the ebbs and flows of the medical industry. Will it be smooth? Not always. But the ability to change with the times is inherent to the business structure. The problem with Johnson & Johnson is that everyone knows just how great a company it is. In fact, with over 50 years of annual dividend increases and an annualized dividend growth rate of nearly 10% over the past decade, dividend investors like me are drawn like moths to JNJ's shares. 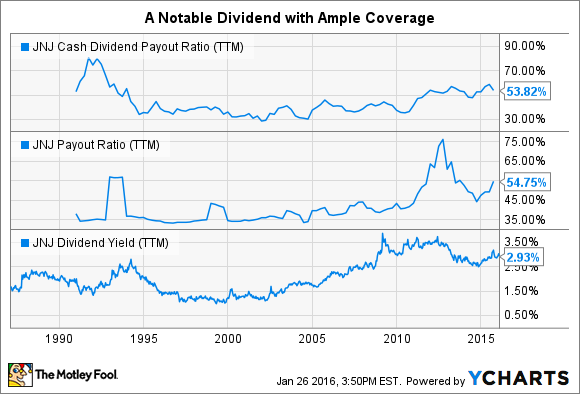 And the dividend looks pretty secure, with a payout ratio of roughly 50% or so. If you want to be even more stringent, the numbers hold up well, for example the company's cash dividend payout ratio, which measures the percentage of cash flow used for the dividend after pulling out capital expenditures and preferred dividends, was about 50%, too. While that's up from the turn of the century, JNJ's cash dividend payout ratio was at similar levels in the early to mid-1990s. So there's a lot to like about JNJ, but I'm cheap. I missed my opportunity to pick JNJ during the 2007 to 2009 recession, when it's yield spiked toward 4%, but I'm watching closely right now for a second opportunity. The yield is around 3% today, with the price off about 10% from recent highs. On the valuation front, the company's P/E is hovering around its five year average, as is the yield. That said, when you examine price to sales and price to book over the last five years, the shares are trading a bit above their historical average. Basically, it looks to me like the market is pricing the shares roughly in-line with historical trends. I'd rather wait for the market to toss the baby out with the bathwater. In other words, I'm holding out for a broad market drop that pulls JNJ down with it. I'm confident that a broad market decline will have virtually no impact on Johnson & Johnson's diversified business, its dedication to quality products, or its inclination to return value to shareholders. And, if the way 2016 has started off is any indication, this could be the year I get my wish and I have a chance to pick up the one dividend stock I want to own in 2016—and, hopefully, the rest of my life.